In my New Testament class I was taught that when we read “Therefore” it’s good to go back to look at what the proceeding statement is “there for” in light of preceding statements. Thankfully, Paul helps us out by reminding us of what he just said- that we are justified by faith. In chapter 4 he used the faith of Abraham to illustrate how God kept his promises to Abraham and to us, sending Jesus as justification for all who believe. I packed that into a pretty small nutshell, so feel free to read Romans 4 yourself to gain a deeper understanding. I love the flow of this passage. Paul is showing us how one thing clearly leads to another and how all of these things work together in our lives as part of God’s redemptive plan: Justification through faith in God brings peace with God through Jesus. Through faith in Jesus, we stand in God’s grace and the hope of his glory. As monumental as it is to possess justification, peace, grace and hope, Paul tells us, “Wait! 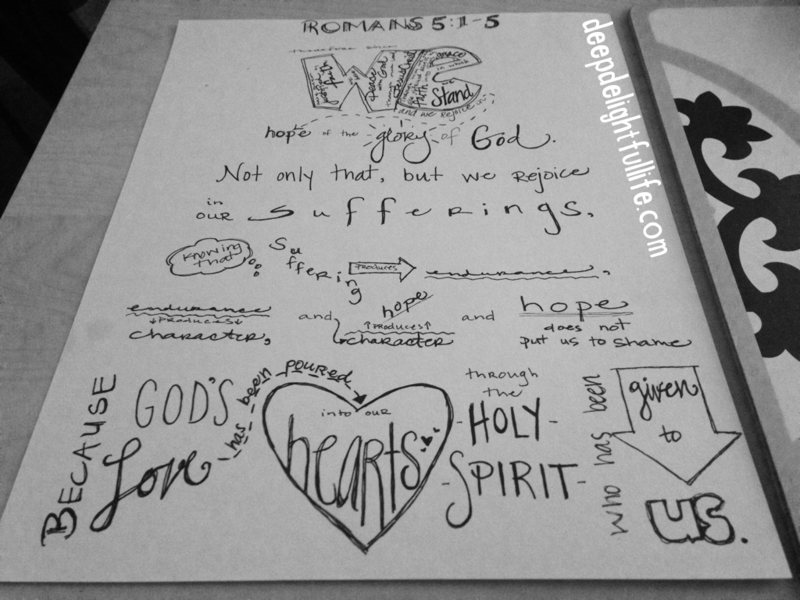 There’s more!” And the more is that we can rejoice in our sufferings. This is one of the major ways that we as Christians are set apart; it is counter-intuitive and counter-cultural to rejoice in our sufferings. To be sure, our culture does embrace the concept of suffering leading to greater things in life, but when I read this passage I see God calling us to something greater and– as is usually the case– stranger. I see that suffering is not merely something to get through in order to achieve a greater end, but that suffering in itself is an opportunity for God to reveal himself, to teach us, to refine us, to plant things in our hearts that could not take root were the ground not broken. I have found this to be true in my life. Whether it’s a run-of-the-mill bad day or a long, uphill climb through the mud of uncertainty or pain or disappointment, God’s Holy Spirit is present in my mind and my heart. He keeps me from sinking by reminding me that I am justified, at peace with God, walking in grace each day, given hope of God’s glory, and that the God who has given me all of this is at work in those deep, dark, muddy moments of suffering. He is planting and fostering in me a light that cannot be extinguished: the power of the Spirit producing Christ-like character in undeserving ME. Isn’t that amazing? What a gift of love from our holy God. Romans is full of these amazing concepts, and is a book every Christian should study in-depth more than once. My favorite study of Romans was with a small group a few years back. We went through chapter by chapter, discussing each verse and memorizing key passages together. I saw the Spirit working in our lives as we sought to understand the deep truths presented to us in this portion of God’s Word. I still don’t fully understand it all, but just that one study (in addition to the other times I have studied Romans in part or whole) fueled my mind and heart going forward. I would love to hear your thoughts on this passage and the ideas it presents!